Darjeeling is a town in the Indian state of West Bengal and centre of the region of the same name, situated in the foothills of the Himalaya at elevations of between 2,000 and 3,000 metres above sea level. With India attaining independence on 15 August 1947, the district of Darjeeling remained in the partitioned section of Bengal (West Bengal) and therefore in the Indian union. With the district's sub-Himalayan and geographical condition, it occupied an unique status in the state. The only remaining industry, that is the Tea industry, continued to play a major role in the economy of the area and the country as well. The other natural wealth forests have been adversely affected by the ever growing population, now estimated to be around 1,200,000. In the years since independence, much has been done for the area's education, communication, attention to cash crops like orange, potato, cardamom, ginger, etc. The region is best known for its tea, see the Darjeeling tea article for more information. 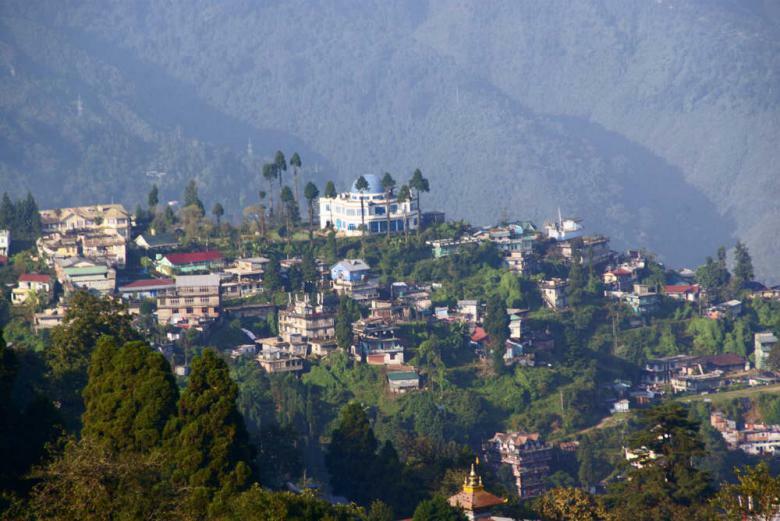 Darjeerling has a modest tourism industry, with attractions including the 'Tiger Hill' sunrise, the zoo, the monastery and of course the tea fields. The town is also sometimes used as a base by trekkers in the Himalaya, and served as the starting point for many attempts on Indian and Nepali peaks in the 20th century. Tenzing Norgay, one of the two men to first climb Mt. Everest grew up in the Sherpa community in Darjeeling. His Everest ascent provided the impetus to establish the Himalayan Mountaineering Institute in Darjeeling in 1954. The town of Darjeeling can be reached by the 80-km long Darjeeling Himalayan Railway (nicknamed the "Toy Train") from Siliguri, or by a road which follows the railway line. The railway was declared a World Heritage Site by UNESCO in 1999. Darjeeling Himalayan Railway is only the second railway to have this honor after the Semmering Railway in Austria. Since the formation of the Darjeeling Gorkha Hill Council in 1988 the hill areas fall under its jurisdiction. It has elected Councilors and they have the authority in managing certain affairs of the hill like education, tourism, health etc. Until the beginning of the 18th century the whole of the area between the present borders of Sikkim and the plains of Bengal, including Darjeeling and Kalimpong, belonged to the rajas of Sikkim. In 1706 they lost Kalimpong to the Bhutanese, and control of the remainder was wrested from them by the Gurkhas who invaded Sikkim in 1780, following consolidation of the latter's rule in Nepal. These annexations by the Gurkhas, however, brought them into conflict with the British East India Company. A series of wars were fought between the two parties, eventually leading to the defeat of the Gurkhas and the ceding of all the land they had taken from the Sikkimese to the East India Company. Part of this territory was restored to the rajas of Sikkim and the country's sovereignty guaranteed by the British in return for British control over any disputes which arose with neighbouring states. One such dispute in 1828 led to the dispatch of two British officers to this area, and it was during their fact-finding tour that they spent some time at Darjeeling (then called Dorje Ling - Place of the Thunderbolt - after the lama who founded the monastery which once stood on Observatory Hill). The officers were quick to appreciate Darjeeling's value as a site for a sanatorium and hill station, and as the key to a pass into Nepal and Tibet. The officers' observations were reported to the authorities in Kolkata and a pretext was eventually found to pressure the raja into granting the site to the British in return for an annual stipend of Rs 3000 (raised to Rs 6000 in 1846).